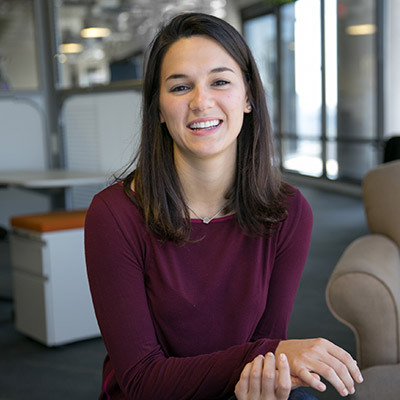 For Regina Vatterott ’16, entrepreneurship is more than an academic exercise. In less than a year, she has taken her product — a “smart” pill container that helps people manage their medications — out of the classroom and into the Austin startup scene. The nervous energy in the room is palpable, but it’s balanced by the promise of champagne. Pitch Night is the final meeting of the summer-long Venture Forth class, a boot camp for startups at Austin’s Tech Ranch, an education and networking hub for technology entrepreneurs. A dozen participants, and twice as many friends and family, perch on brightly colored chairs in the second floor atrium of an office building on the north side of town. Before the students toast their 10 weeks of hard work, they stand and present their concepts: a shared commercial kitchen space, a roommate-matching platform, a socially conscious import business. At 8 p.m., it is time for the final pitch, delivered by the two youngest Venture Forth participants. Regina Vatterott ’16 and her co-founder, Abe Matamoros, a recent University of Tulsa graduate, make their way to the front of the room. “We want to start by telling you about Abe’s grandfather, our inspiration,” Vatterott begins, as a snapshot of the elderly man is projected onto the screen behind her. “He spends too much time organizing his medications. In fact, there was a time recently when he stopped taking them, because organizing them was so time-consuming. He ended up getting very sick. He was lucky that he recovered, but each year in the United States 125,000 people die because they’re not taking their medications consistently or correctly.” Medication nonadherence costs the U.S. healthcare system between $100 billion and $289 billion annually. She advances to the next slide, a picture of a jewelry-box-like container outfitted with LED lights and a digital clock. As the duo finish their pitch, their classmates applaud, and then the questions begin: How will the Affordable Care Act affect your market? How will you test your medical device? Have you considered Kickstarter as a funding source? Five months earlier, on March 28, 2015, Vatterott makes a different pitch, alone, to an audience of judges in the St. Edward’s University Business Plan Competition. She recounts how the idea for the business formed with the frightening incident with Matamoros’ grandfather. Looking for a device to help the elder Matamoros keep track of his medications, the two longtime friends found only cheap day-of-the-week plastic pill containers and $500-plus “smart” pill containers that could be programmed with dosages and times. So they built their own, using supplies from RadioShack and Hobby Lobby. The device she’s pitching in her business plan has compartments for multiple medications, each of which is meant to hold the entire bottle’s worth of pills, and a digital clock. The user or caregiver programs it with information about how many pills should be taken and at what time of day. When it’s time to take a pill, that compartment lights up in a color associated with the dosage (white for one pill, red for two) and makes a sound. After the patient has taken the medicine, he presses a button to turn off the light, and that information is sent via the associated app to the smartphone or computer of his care provider or a relative who’s signed up for alerts. But it is still a long way from hitting the market. “How do you plan to manufacture your product?” one of the judges asks. Vatterott answers that she doesn’t know yet. Healthcare regulations restrict what materials can be used to make the device and the information that can be used in the smartphone app. She’s also still evaluating the name. “The idea is that elephants — the ‘Ellie’ — have good memories, and we want to help people remember everything,” she explains. “And ‘Ellie’ works with the LED lights. ‘Grid’ is the grid of the pill container. Although we think the name is a good one, it might not be intuitive to everyone. The judges withdraw to deliberate. Executive in Residence Tony Alvarado, the interim director of the Entrepreneurship program and Vatterott’s academic advisor, has been watching in the back of the room. He notes that she’d performed well: She hadn’t used notes or stood behind the lecturn, she’d maintained eye contact and a relaxed demeanor, and she’d been honest when she didn’t know the answer to a question. In a moment, the judges emerge and announce their decision: Vatterott won first place in the competition, which comes with a $2,500 purse. Four months have passed, and Vatterott and Matamoros’ venture continues to gather steam. They are camping out at a north Austin coffee shop, going over their pitches for this week’s important meetings. Tomorrow night Matamoros will present at the Austin Hardware Startup Meetup at Capital Factory, an incubator downtown; it’s a chance to put out feelers for a technical co-founder. The next day they’ll get feedback from staff at Memorial Hermann–Texas Medical Center in their hometown of Houston. But tonight they have class, the fourth meeting of their Venture Forth program. Started by Tech Ranch founder and CEO Kevin Koym, the Venture Forth program teaches people how to turn business ideas into reality. Paula Sabrsula MBA ’12, who has experience in the pharmaceutical industry and mentors young entrepreneurs, sponsors their attendance in the program, an intense course that only a handful of college students have ever taken. Every week starts with a “jam session” dedicated to longer and longer pitches. Not only had the Tech Ranch cohort been moved by Vatterott’s bold pitch; to her surprise, the group also had gotten attached to the name “EllieGrid.” So Vatterott and Matamoros worked with a lawyer to do a patent search — checking to see if any very similar products were already on the market — and, finding none, they filed a provisional patent that would protect their idea while they hired an industrial designer. The two were leaning toward a firm in Mexico City that Matamoros had vetted via phone and an in-person visit. They spread out photos of their new functioning prototype, the first and last one they’ll use a 3D printer to make. They used the slow and error-prone printer for the prototype but plan to manufacture the actual devices with injection moldings instead. First, Vatterott and Matamoros need to find a third co-founder, someone with experience in electronic components who can work on the circuit board. Vatterott isn’t the kind of lifelong entrepreneur whose parents remember her selling pencils to her first-grade classmates or squeezing hundreds of dollars out of a lemonade stand. 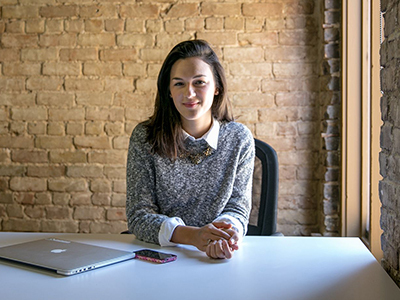 She didn’t even know what to study in college until she found the Entrepreneurship major at St. Edward’s. But it turned out to be the perfect fit. And she was motivated by her Catholic upbringing, which nudged her toward a career that would give back. In high school she learned about social enterprise companies like TOMS Shoes, whose “one for one” model builds a donation into every purchase. “I knew I wanted to help people in whatever way I could, and I saw entrepreneurship as a sustainable and scalable way to do that,” she says. That mission fits well with the focus on social enterprise at St. Edward’s, says Alvarado. The elevator doors open, and Vatterott steps onto the 16th floor of the Omni Hotel building in downtown Austin. The receptionist smiles and waves her into Capital Factory. 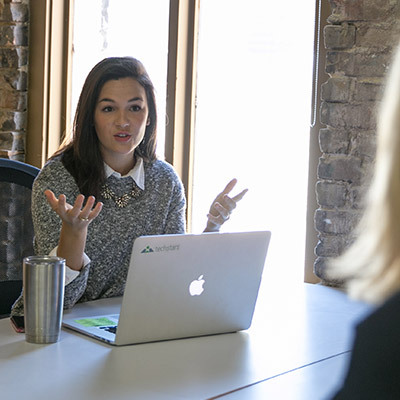 Through the partnership between Capital Factory and St. Edward’s, Vatterott has access to the accelerator’s work areas, video production studio, “office hours” with expert mentors and daily opportunities to network with Austin’s community of entrepreneurs. After stuffing her lunch into the sleek communal fridge, Vatterott winds her way to an empty seat. She passes the accouterments of the startup scene: a rack of bicycles on the wall, a beer keg, desks connected to treadmills and stationary bicycles, exercise balls, enormous beanbag chairs. Most of them are occupied by casually dressed people in their 20s, 30s and 40s, who are either staring intently at their laptop screens or talking animatedly with colleagues. Two months ago, when Matamoros gave his pitch here at the Austin Hardware Startup Meetup, he and Vatterott had been approached by an engineer named Hieu Nguyen, a new arrival to Austin, who’d become their much-needed technical co-founder. Now all they need is a software developer. And they need one other thing: money. So far, the co-founders have paid the venture’s expenses from Matamoros’ savings. They can offer additional partners only equity in the company, not a salary, which isn’t unusual for startups. But they’ll need money for ongoing legal services and supplies, like circuit boards and hardware. Sitting at one of the long communal tables, Vatterott lays out their options. They could pursue funding from an angel investor, someone who, in addition to investing his or her own money in the company, could offer EllieGrid business or technical expertise for a number of years. They could work with a venture capitalist or VC firm, which would offer multiple investors’ pooled money in exchange for a percentage of the company. They could start a crowdfunding campaign, like Kickstarter. And one investor has already decided the EllieGrid is going places. Matamoros had been in conversation with an angel investor interested in the tech industry when the man offered him $1 million in exchange for a share of the company. While they are the youngest members of their Tech Ranch cohort, the EllieGrid team is the only one to receive a funding offer during the course. And that isn’t the only way Vatterott stands out, says Jaime Sutton, Tech Ranch’s director of marketing and operations. Vatterott isn’t afraid to ask questions when she doesn’t understand the material, or when other entrepreneurs aren’t explaining their ventures clearly. With the conversations around her at Capital Factory blending into a comfortable background noise, Vatterott opens her trusty calendar. She needs to plan her schedule for Austin Startup Week, when she might meet the software developer who’d complete their team. She needs to work on EllieGrid’s website. And she has to manage her 13 hours of coursework. “The startup world isn’t always glamorous like social media and movies make it out to be,” she says. “It’s a lot of long hours. Since October 2015, things have been moving fast for the EllieGrid team — which now includes Vatterott, Matamoros, Nguyen and Nic Dhanam, a college friend of Matamoros’ who is the startup’s chief product officer. They’ve talked up the startup at other pitch competitions. They were finalists in the CVS Retail and Health Innovation Challenge at Wake Forest University, and they won first place (and a $1,000 check) at the IBM Cultivate Health Hackathon in Austin. They’re applying to various accelerators, a more intense version of the Venture Forth class that comes with mentors, connections and guaranteed investment dollars. In mid-January, they were announced as finalists at the IOT/M2M Innovation World Cup in Barcelona. They’ll have the opportunity to present EllieGrid on stage, if they can find a way to get to Spain by the end of February. That nomination also means expediting the prototype, so they have a working device to show. These are all big steps for a company that started just over a year ago as a DIY experiment with hobby shop parts. To keep up with Vatterott’s progress, visit EllieGrid.com or follow @EllieGrid on Twitter.